I've been looking for more variety in my breakfast options and that's how I came upon this quinoa dish. 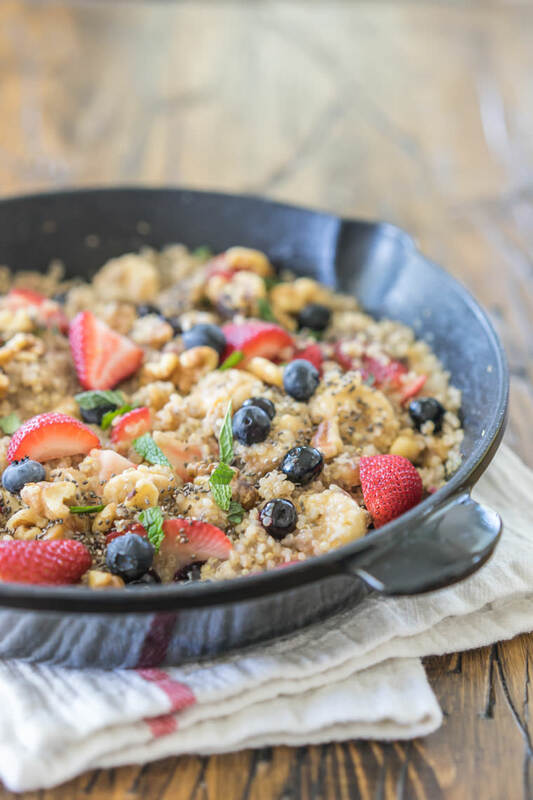 The idea here was to take some leftover fluffy quinoa, throw it in a skillet with coconut milk, and add a bunch of delicious fruit and superfoods into the pan to create a slightly-sweet breakfast skillet that has as much nutrition as it does flavor – all in less than 10 minutes. With complete protein, carbs, healthy fats, and antioxidants, it's the perfect breakfast. The thing I love most about eating quinoa for breakfast is the way it gives you "light" energy. Unlike other grains that can make me feel sluggish, quinoa always leaves me feeling full but energised (perhaps this is because it's not a grain at all, but a seed/pseudocereal). Having leftover quinoa to use in this recipe makes it even easier, but if you're making it fresh, do that first. The recipe calls for about two cups of fluffy quinoa, which means you'll need to start out with 1 cup of dry quinoa and 2 cups of water. With the quinoa ready, add it to a large skillet along with a pinch of salt and some lemon juice. Then add the coconut milk and banana (cut into rounds). Turn the heat to medium-low and give these ingredients about 5 minutes to simmer, stirring occasionally. NOTE: If you want to make a lower calorie option, you can use any non-dairy milk but it won't be nearly as creamy. Next add all the remaining ingredients (minus the mint) and give it another 5 minutes until most of the coconut milk is absorbed and everything is blending together beautifully. Garnish with some fresh chopped mint leaves and enjoy.